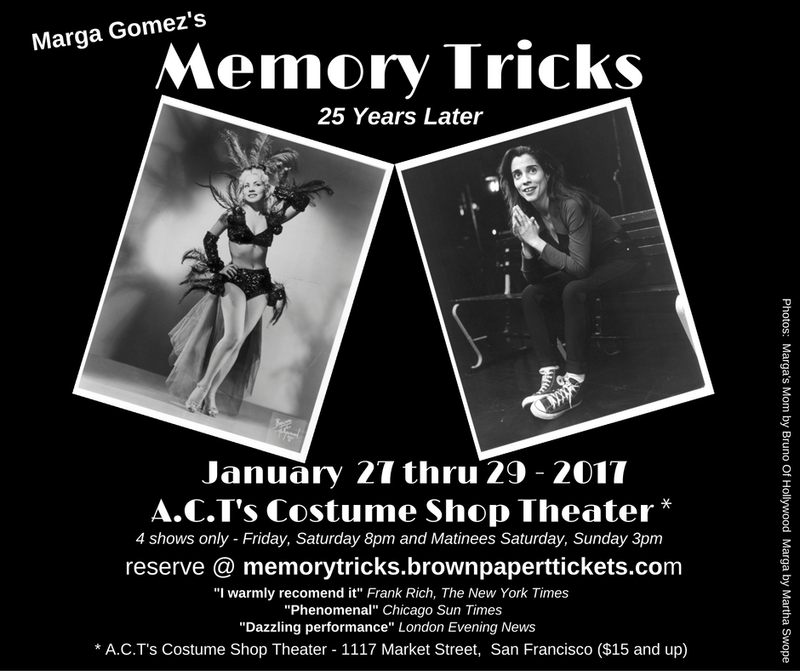 To commemorate 25 years as a solo theater artist Marga Gomez will revive her early 90's show "Memory Tricks" at A.C.T's Costume shop - four shows only. Memory Tricks, set in New York and Paris, is the funny and poignant story of Marga's complicated relationship with her hyper feminine showgirl mother. Memory Tricks remains the most critically acclaimed of her 12 solo plays. Memory Tricks has been presented in San Francisco at The Marsh, Off Broadway at The Public Theater, and internationally at London's ICA, The Edinburgh Fringe Festival, and Montreal's Juste Pour Rire. "The autobiographical monologue has been raised to a new level with a new generation or writer performers. Among the best is Marga Gomez... hilarious and moving 'Memory Tricks'"
"funny and touching stage autobiography...I warmly recommend it""
"There are two kinds of laughter in the comedy world: the laughter of anesthesia and the laughter of enlightenment. Most stand-up comics aim for anesthesia, dispensing a kind of comedic narcotic to deaden our pain and allow us to deny, however fleetingly, our problems. San Francisco-based monologuist Marga Gomez does something much more difficult in her performances. She takes her most personal foibles and most painful childhood memories and transforms them into a very liberating kind of comedy. In Memory Tricks, for example, she holds up for all the world to see her love-hate relationship with her difficult father (who was a comedian) and her vain, high-strung mother (who was an exotic dancer). Gomez's performances are a kind of spiritual exercise: though they're entertaining--Gomez is a very funny woman--they also provide a kind of psychological road map for self-discovery." Latin Standards at Segerstrom Center's "Off Center Festival"